The RhinoPolyhedra plug-in for Rhino 5 for Windows lets you create and visualize a variety of polyhedral shapes—over 450 different shapes. 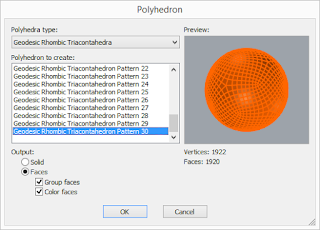 RhinoPolyhedra supports both 32-bit and 64-bit Rhino 5 for Windows. 15 additional Geodesic Cube solid shapes and 30 new Geodesic Rhombic Triacontahedra solid shapes have been added. Requires Rhino 5 Service Release 9 (SR9) or newer.